Ireland will bring the curtain down on their Six Nations campaign against Scotland this weekend with Triple Crown glory up for grabs and the Championship title still in play. But win, lose or draw the occasion will be marked by more than a tinge of sadness as their all-too-brief residence at the magnificent Croke Park comes to an end. The clash with the Scots will mark the end of a 14-Test stay at the traditional home of Gaelic Athletic Association (GAA), spanning the last four years. Although those figures pale into insignificance compared to the 244 games played at Lansdowne Road over a drama-laden 128 years, the parting of the ways will be no doubt just as painful so successful has been their tenancy. The new 50,000-seater Aviva Stadium, built on the site of the old Lansdowne Road stadium in the Ballsbridge area of Dublin, is near to completion and certainly looks spectacular. It nevertheless faces a battle to fill the sizeable void left by the beloved Croker. So fruitful has the partnership been it seems strange that there were, and in some cases still are, so many concerns about opening the stadium up to rugby union. The roots of that deep-seated and well-documented animosity between the GAA and the 'foreign' games of English origin can be traced back to Ireland's battle for independence from British rule and in particular to one of the darkest hours in Irish history - the first Bloody Sunday on November 21, 1920. On that tragic day British 'Black and Tan' police auxiliaries, reportedly determined to exact revenge for Irish Republican Army attacks earlier in the day, opened fire on the crowd at Croke Park who had gathered for the Gaelic football match between Dublin and Tipperary. A total of 14 people were killed including Tipperary player Michael Hogan, whose name lives on thanks to the stadium's Hogan Stand. The famous Hill 16 terrace offers another example of the historical significance of the stadium having taken its name from 1916 Easter Rising against British rule. But over the years that ill-feeling softened in parts and the prospect of the Irish rugby and football sides playing their home fixtures overseas during the building of the new stadium finally prompted an amendment to Rule 42 that allowed for the possibility of Croke Park being used. The GAA had relented, a decision widely applauded, but made sure it would be worth their while with a rental agreement that guaranteed them 25% of the gate takings for each fixture which has since generated an estimated €36 million with each union game worth approximately €1.2m. The first visitors were France during the 2007 Six Nations and Les Bleus promptly went and spoiled the party with classic smash and grab. The hosts looked on course for victory before Vincent Clerc pounced in the final minute with a try that stunned the home crowd and propelled his side to a 20-17 win - a defeat that effectively denied Ireland the Grand Slam. France would later lose to England and only pip Ireland to the title on points difference making their Croke Park debut all the more painful. Free of the nerves that arguably hindered them against the French, Ireland returned two weeks later for a fixture that would have much greater historical significance. England's highly-charged visit was preceded by widespread debate about the flying of the union flag and the reception for God Save the Queen but the contest failed to conjure the same kind of intensity. Ireland dominated throughout on their way to a thumping 43-13 victory and while the side were praised for their powerful display the country as a whole were applauded for their maturity. "The Aviva Stadium that may well be an aesthetic wonder but has a staggering 30,000 less seats than officials are regularly selling out at Croke Park." Triple Crown glory was on the line when Wales made their first appearance at the stadium in 2008 but again there was a fascinating sub-plot - Warren Gatland's return to Dublin to lock horns with Eddie O'Sullivan, the man who replaced him as Ireland coach in controversial circumstances seven years previously. Wales had not won in Ireland for eight years and weathered yellow cards for Mike Phillips and then Martyn Williams on their way to a narrow 16-12 success. Winger Shane Williams scored the decisive try to equal Gareth Thomas' Welsh record of 40 and keep his side on course for a Grand Slam that they duly clinched against France the following week. New Zealand were the first southern hemisphere visitors later the same year and were comfortable winners - to date only the second side to have tasted success at Croker - but Argentina were beaten the following week at the start of a 12-game unbeaten run that would include victories over South Africa and a draw with Australia where captain Brian O'Driscoll - so often a pivotal figure - grabbed a last gasp try. The stadium may not have witnessed the moment that Ireland ended a 61-year wait for a Grand Slam, that moment falling at Wales' Millennium Stadium in 2009, but as host for the impressive victories over both France and England it could rightly lay claim to having played its part in what was an historic day for the sport in Ireland. O'Driscoll, who appears to have thrived on the bigger stage more than most, took centre stage again last weekend on the occasion of his 100th Ireland cap when the famous Croker roar erupted once more to hail their ever-inspirational leader. 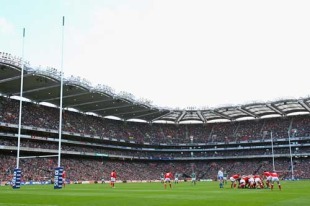 Not content with showcasing the best international action, Croke Park opened its doors to the Heineken Cup in 2009 for the all-Irish semi-final clash between Leinster and Munster. Tries from Gordon D'Arcy, Luke Fitzgerald and man of the match O'Driscoll along with a superb defensive display saw Leinster progress to their first-ever European final - where they would account for Leicester - and end the hopes of their fierce rivals and the defending champions. The occasion was a visual feast with a world record crowd for a club game of 82,208 vociferous fans playing their part in a pulsating contest. Such records will be out of reach following the move to the Aviva Stadium. It may well be an aesthetic wonder but has a staggering 30,000 less seats than officials are regularly selling out at Croke Park. A golden age for Irish rugby has seen the sport's profile rocket and fears about the sport's ability to fill the extra seats at Croke Park were soon dispelled with a high demand for tickets despite the €70-90 asking price. That popularity and the novelty of a new stadium should ensure packed houses when they move but the significantly lower capacity is sure to take its toll on the union's balance sheet even though they will no longer have to pay rent to the GAA. And the new stadium needs to be paid for of course. Both the IRFU and the Football Association of Ireland are committed to the new stadium and no doubt contractual binds prevent them from even considering the use of Croke Park for their bigger fixtures - but the problem for the Irish rugby side is that almost every game currently falls into that category. That headache is for the suits to ponder while O'Driscoll and co must ensure the side continues to perform on the field - starting on Saturday when their final Croke Park encore should be cause to celebrate a magical chapter in the team's history. Graham Jenkins is the Senior Editor of ESPNscrum.